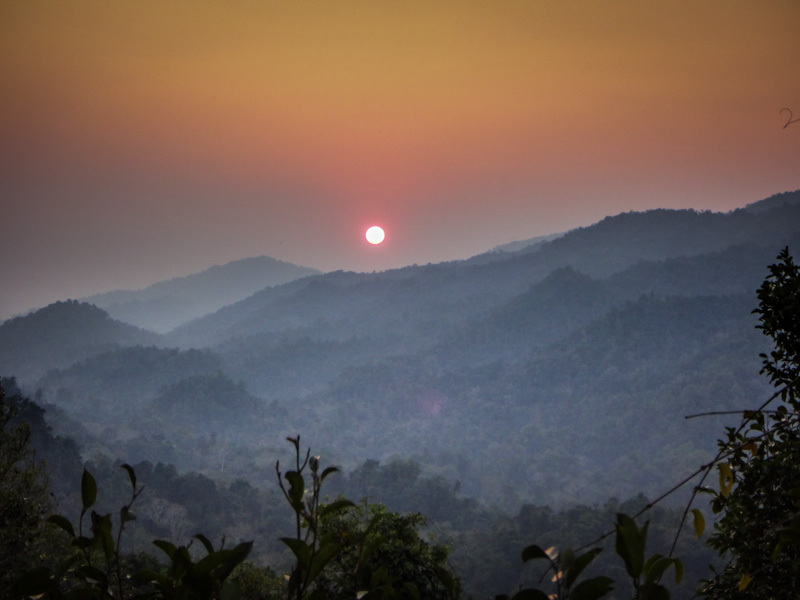 The Gibbon Experience in Laos – Worth It? 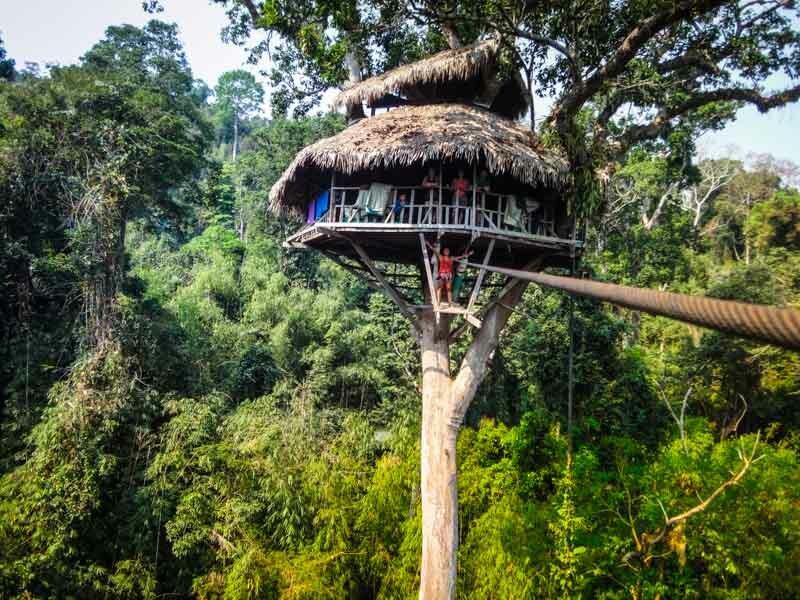 At this long-running ecotourism project, a series of ziplines criss-cross the canopy in the Bokeo Nature Reserve – home to tigers, clouded leopards, black bears and the black-crested gibbon – giving you the chance to soar across valleys and stay in 40m-high tree-houses, claimed to be the world’s tallest. 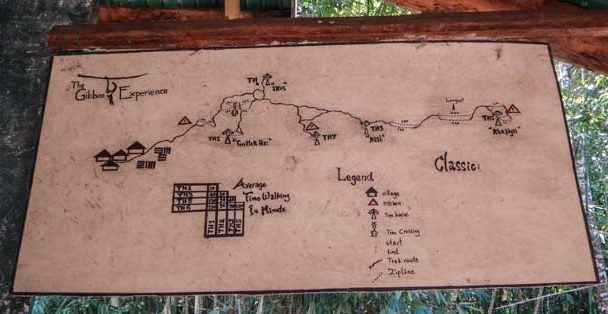 There are three tour options (two-day Express, or three-day Classic and Waterfall), each involving some trekking. 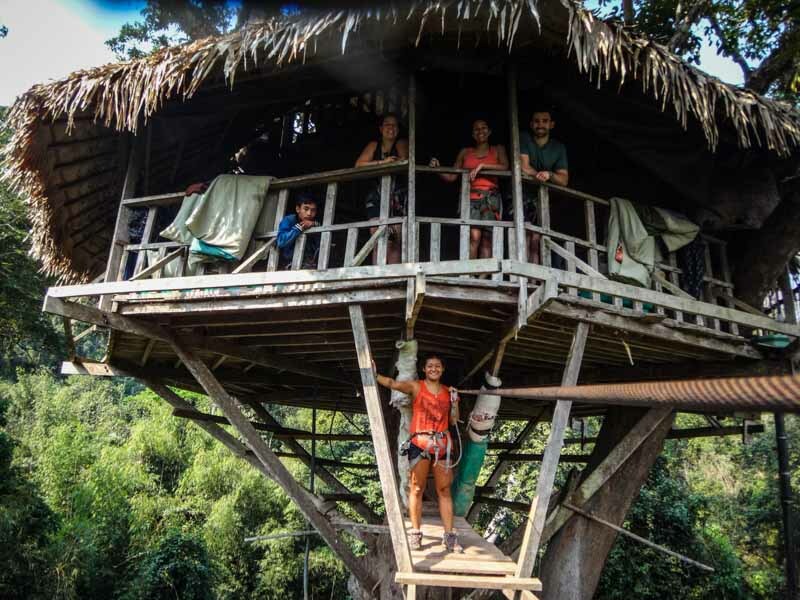 Well-cooked meals are ziplined in by your guide. 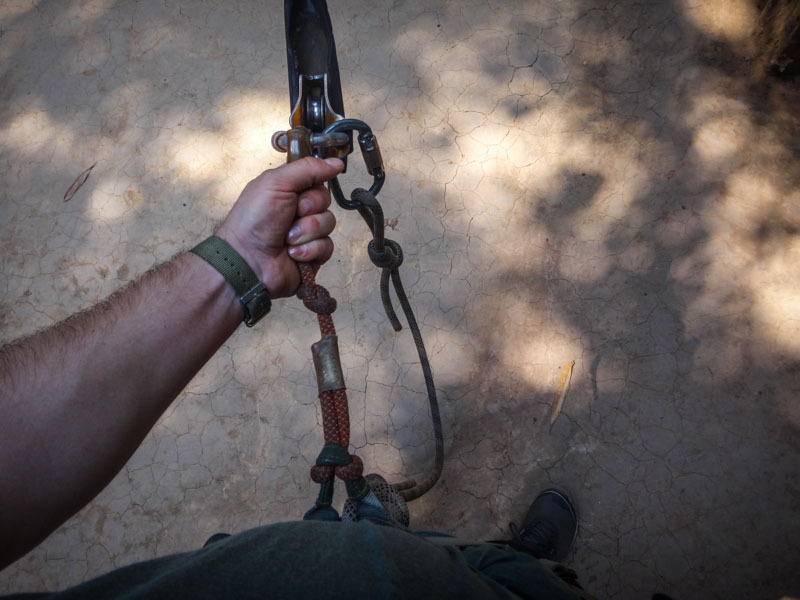 The guides are helpful, though make sure you’re personally vigilant with the knots in your harness. It’s optional to wear a helmet, but we recommend asking for one given the speed you travel along the cable. Also check that your karabiner actually closes. Should it rain when you’re ziplining, remember you need more time to slow down with your brake (a humble bit of bike tyre). For all three tour options, we recommend being in good shape. Pre-payment online through PayPal works well but do be patient as communication isn’t always immediate. 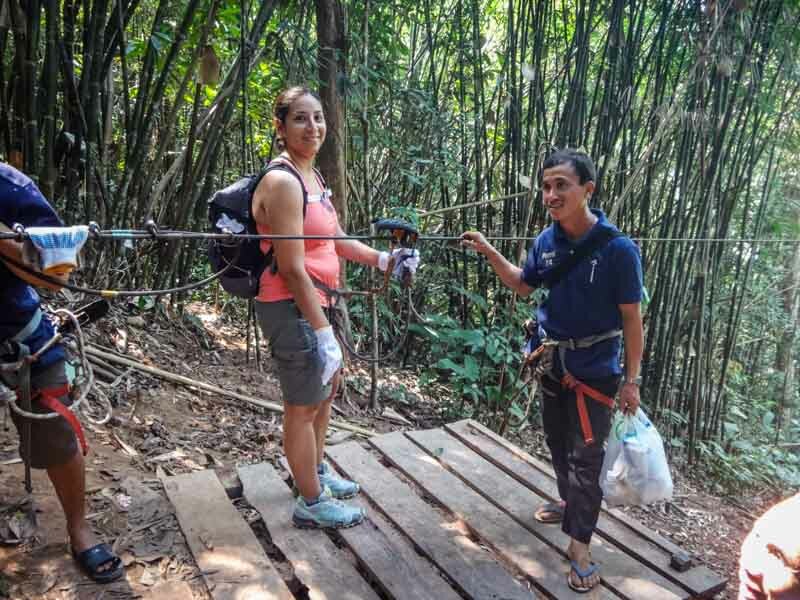 One day before departure, check in at the Huay Xai Gibbon Experience Office on Th Saykhong. It’s also advisable to bring a torch (flashlight), water bottle and earplugs to deflect the sound of a million crickets, but otherwise leave most of your baggage in the office storeroom. 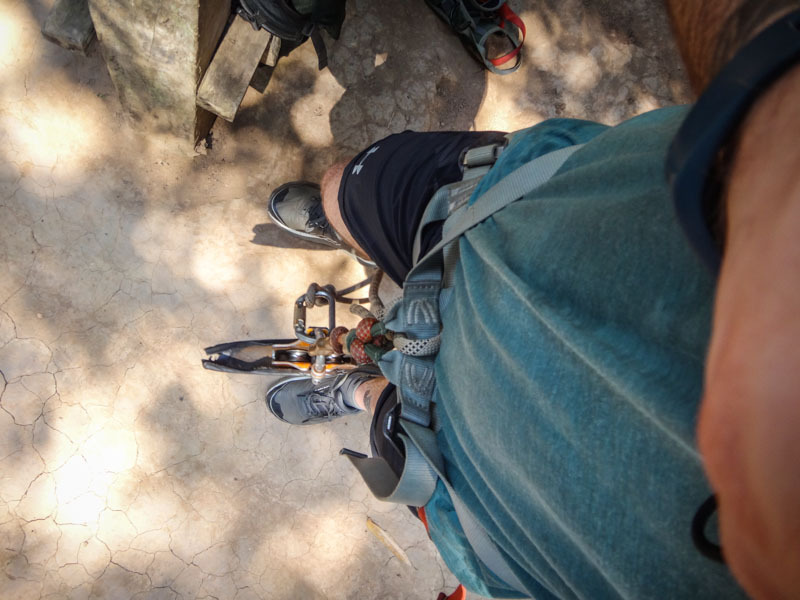 Everything you bring you must carry on your back over some steep hikes and on the ziplines. As there’ll be no electricity, don’t forget to pre-charge camera batteries. Tragically, an accident here in March 2017 resulted in the death of one traveller and tours were temporarily suspended. Following investigations, the Gibbon Experience resumed services and began implementing a range of stricter safety protocols. See the website for the latest developments. The price is not listed on their website, but the FAQ notes that each tour costs about $100 (USD) per person per day. We paid €590/$656 for two people on the Classic Tour in March 2017. Bookings can be made through the Gibbon Experience website. There, you can choose your tour and departure date. Note: tours are staggered and leave every-other day, so it’s possible that the Classic and/or Waterfall may not be available on your desired date. We had wanted to do the Waterfall tour but instead had to go with the classic because of this. It was still great! 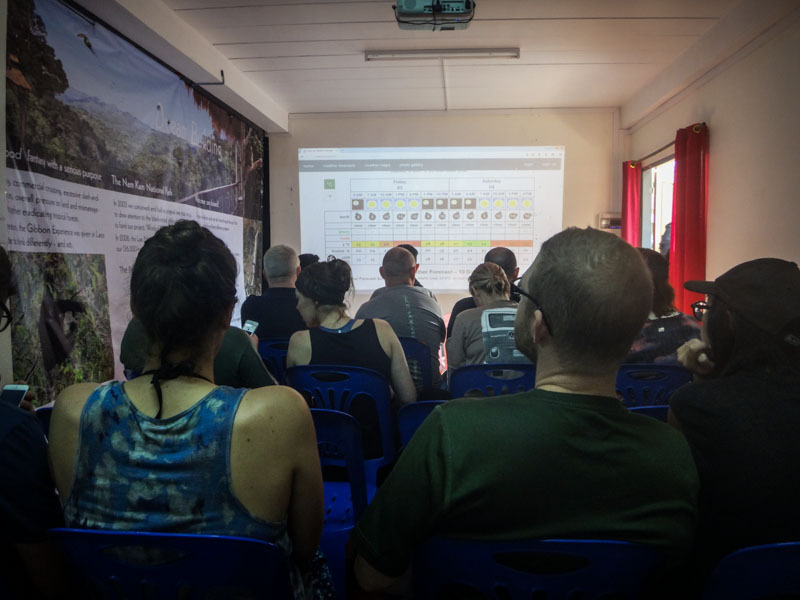 We met at the Gibbon Experience office in Huay Xai, Laos at 8am (after a long day of travelling from Bangkok the day before!). There were at least 25 people milling around already, so it seems that business is good! Their main office had burned down just days before our arrival, so they were operating out of a temporary office right next to our guesthouse. We signed some paperwork, verified that we had paid, and then waited around for a while until they showed us a couple of quick videos about the tour and safety info. 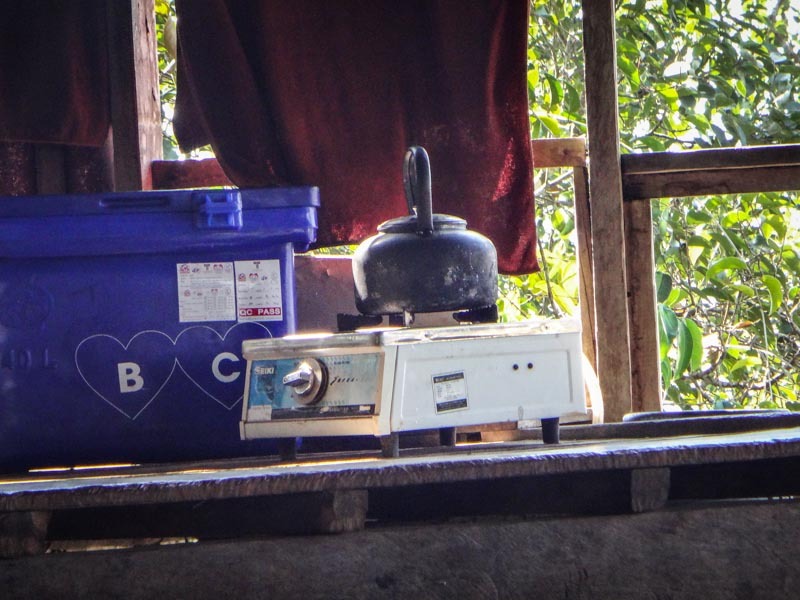 After that, we stored our packs in the basement (we brought only day packs with us) and piled into the backs of pickup trucks for the 2.5 hour ride to the jungle. It was a long, uncomfortable, and stifling ride. We stopped about halfway for a quick break where you could use the bathroom and pick up some last-minute snacks or supplies, and then we trudged on for a bit longer. I was very happy when the ride was over. 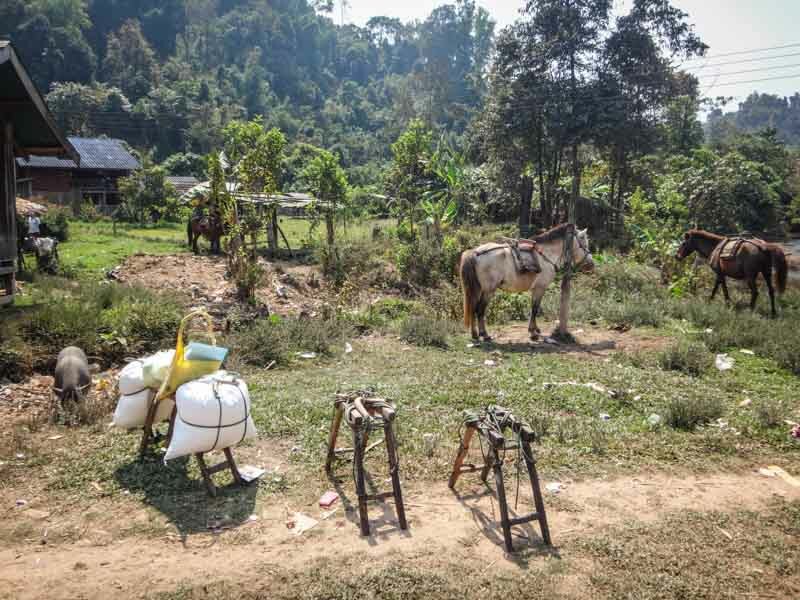 We ended up in a little village where all the guides and helpers weighed out food and strapped bags to donkeys. We hung out, drank a beer (which they were passing out), and baked in the sun while waiting to begin. After maybe 20 minutes, we headed out by foot on a path into the woods. About half an hour after starting, we stopped for a rest and they passed out curry chicken sandwiches. We then pushed on, hiking another 40 minutes or so until the ‘kitchen’, which is the starting point for all tours. 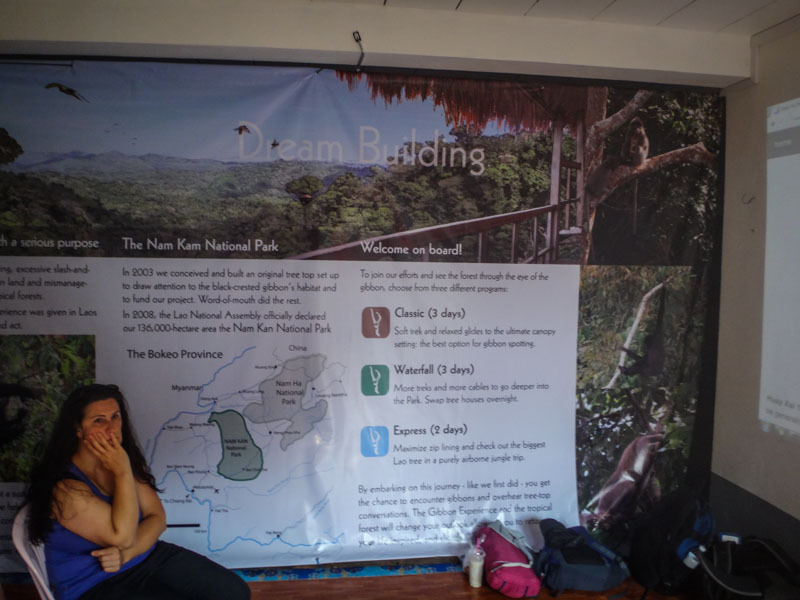 There, we waited for everyone to arrive and then the lead guide described the various tree houses and capacities. There was only one which was for two people only, and an older German couple snagged it before we could, so we were shacked up with two girls from Brazil in a 4-person house (#3). According to our guides, ours had the best view! 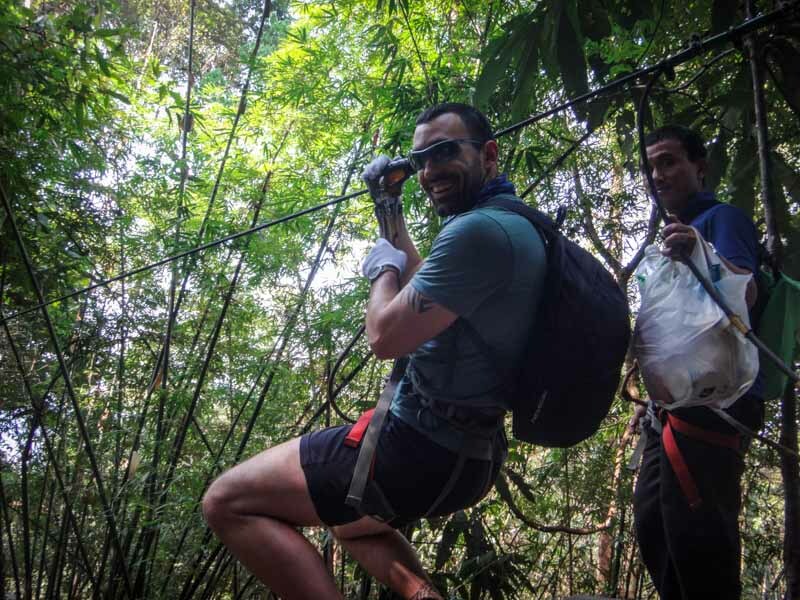 We then strapped on our harnesses and headed back into the jungle. For the next couple of hours, we hiked, zip lined, and made our way to the tree house. It was so much fun! 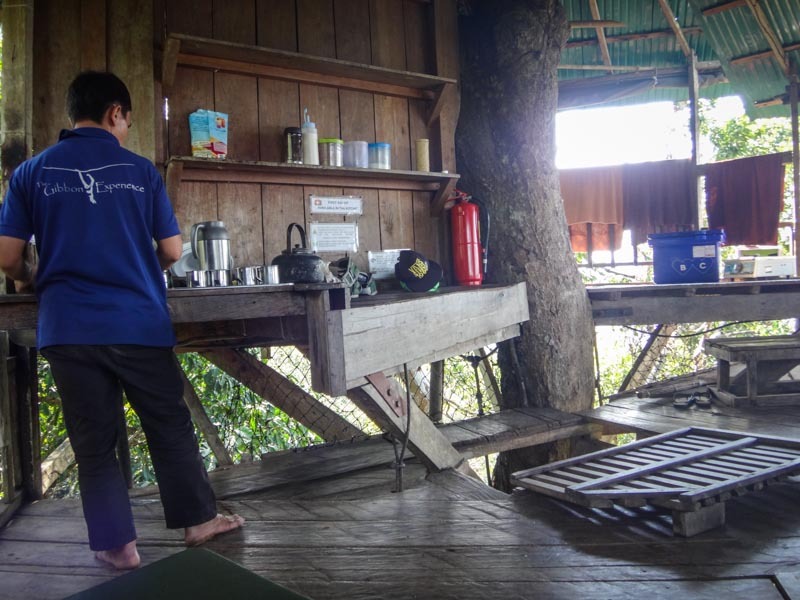 We made it at about 3pm and our guide made us coffee while we hung out and explored the treehouse. Our guide to the left making coffee in the kitchen, hatch door to the right. From one corner looking out. Kettle with gas hot plate. Ahh! Taking it easy on our bedding. Mosquito net behind. 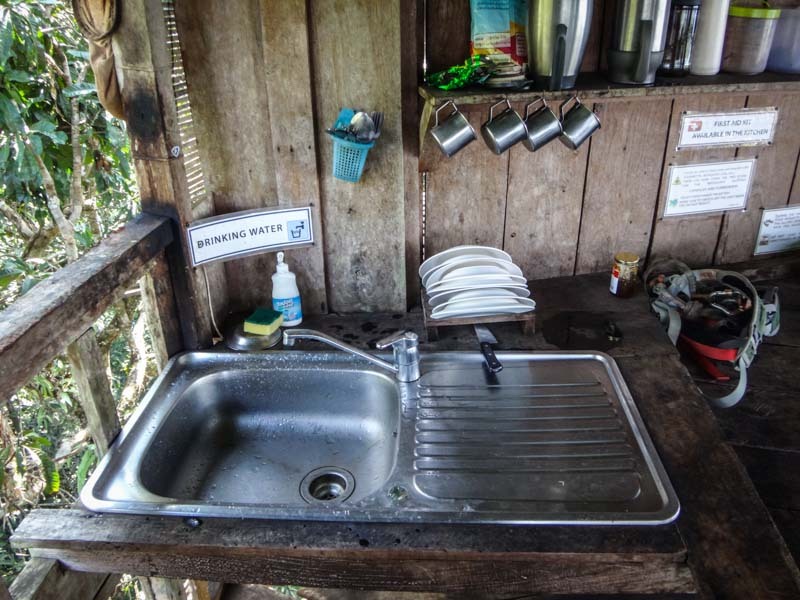 Kitchen with fresh drinking water! Bathroom with toilet, sink, and shower. The water was freezing! The guide showed us pictures of some of the wildlife we might see, then left us to our own devices for a while. We put our harnesses back on and did a few more zip lines before settling down for dinner (brought in by zip line by another guide!). We had beef, vegetables, eggplant, mushrooms, and rice. It was delightful. We then took (cold) showers, reapplied bug spray, and enjoyed the beautiful sunset. It was an early night since there was no electricity! Before going to sleep, we put up our mosquito nets (which were more like tents than nets–covered in fabric) at about 7:30pm. There wasn’t really anything to do, but I had brought my tablet with me and so we watched a movie (Hacksaw Ridge!) before finally going to bed around 10pm. We both slept with earplugs in because it was so noisy with all the insects and wildlife. 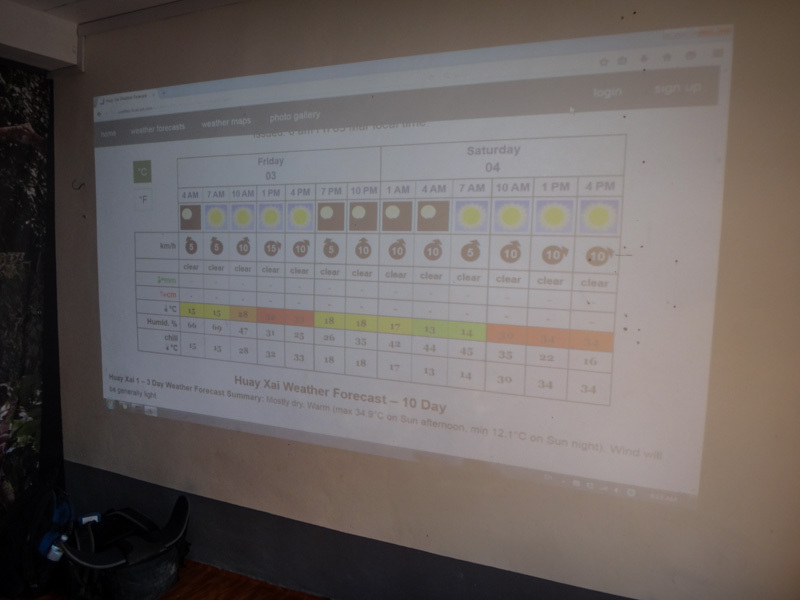 It was pretty hot and stuffy inside the mosquito nets, but we would have been eaten alive without them. It did cool down quite a bit overnight so we used our blankets, but I sure could have used a fan in there too! The other 3 were all up before 7am the next morning, but I slept in a few minutes later. The guide told us that the Gibbons are usually out at sunrise, but I was feeling pretty drained and figured that we hadn’t heard any Gibbons yet anyway, so what’s the point of getting up? They did eventually start to sing and breakfast was on the way, so I got up soon after. Right at 8am our guide zipped down to our house with his buckets of food. They use a small cooler and an Indian – style 4 piece stackable tower for all our meals. The cooler is always filled with rice (even for breakfast) and the 4 stackable containers have different dishes-usually one with meat/eggs and the rest with various vegetables and fruit. This meal was no different. After finishing up, we took our time getting ready and already had other groups showing up to check out our tree house. As it turns out, we’d be doing the same all day. We eventually set out at about 9am and basically hiked through the jungle and ziplined to each of the 7 tree houses, missing just a couple. They are all surprisingly far away from each other and in the heat the hike was challenging, but a lot of fun. 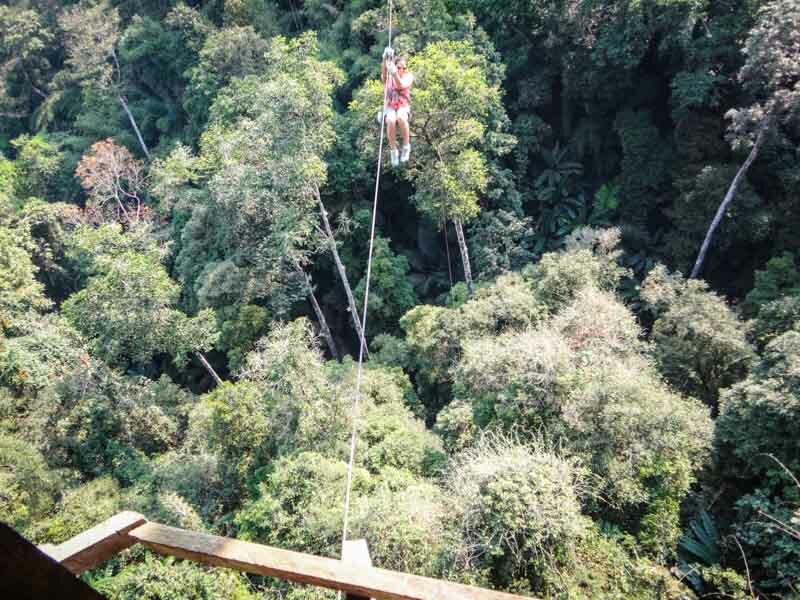 At one point we got to do the longest zipline (500m) twice, which was super fun. For the rest of the afternoon we did more if the same, but it seemed like longer walks were involved between the tree houses. What I’ve noticed in seeing the others is that ours has the best view, but is the smallest. Some have multiple stories and little side rooms, where ours is just one open room. I’ll take our view over any of theirs, though! The ziplines were fairly easy to operate, but sometimes it was a bit hard to gauge how much speed you’d need to get across. Some of the lines were at steeper angles than others so no extra speed was needed (which can be generated by tucking your knees to your chest), whereas others were more flat and we wouldn’t make it to the end. In that case, we’d have to pull ourselves the rest of the way hand-over-hand. If you get going too fast, there’s a “brake” that can be used, which is just a piece of car tire attached to the mechanism on the line that you could squeeze to slow yourself down. As Veronica found out, it didn’t always go to plan! 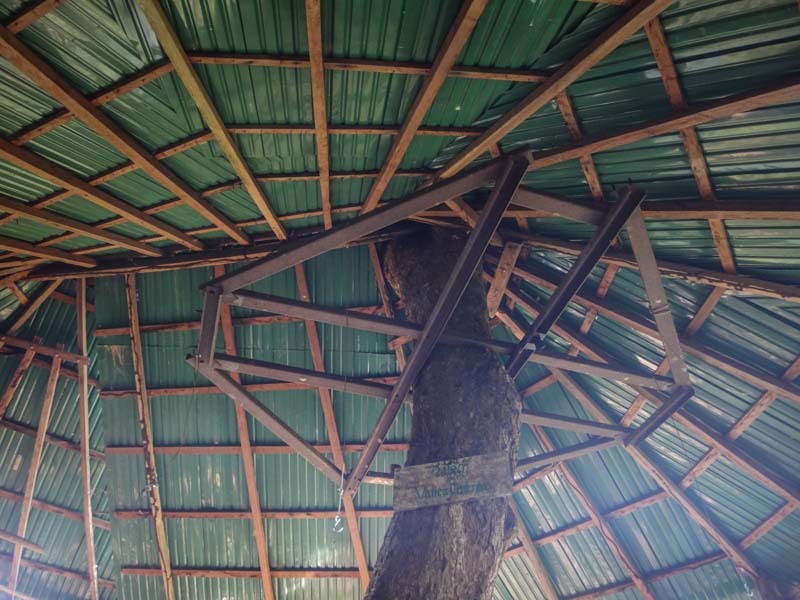 Anyway, we stopped for a while at treehouse #7 and had our first Gibbon sighting. In fact, we saw several over the course of about 20 minutes. They were young ones, swinging from trees and hanging out at a distance. Apparently they never get close to the tree houses. It was pretty cool to see, although I wish they would have been closer! The remainder of the afternoon was spent doing a couple more ziplines and quite a bit more hiking. We finally made it back to the tree house at about 3:30pm and were all pretty exhausted. I think a combination of the changed diet (almost zero protein and all carbs in these meals) plus the heat has made me sluggish and perpetually drowsy. 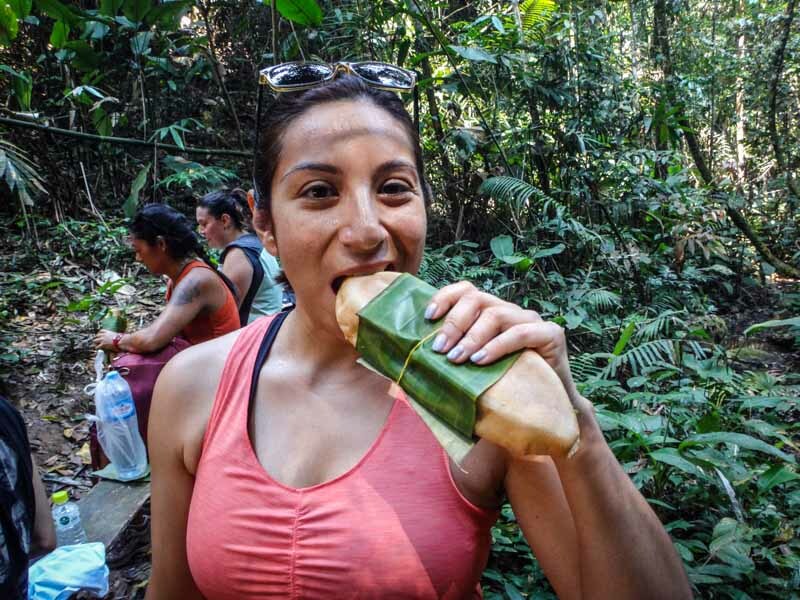 So when we got back I immediately crashed and took a nap, getting up only to take a cold shower and wait for our guide to arrive with dinner. That night was more of the same as we watched a show on the tablet and tried to keep the bugs at bay. We still had a couple more hours of trekking and zip lining in the morning! We woke up the next day at around 7am but didn’t hear any gibbons this time. Boo! One of our guides zipped in right before 8am for breakfast, this time bringing some eggs and bread instead of rice (was so sick of it!). We ate, packed up, and said goodbye to our lovely tree house. The day before, our guide was trying to explain the plan for the day but it wasn’t communicated very well. 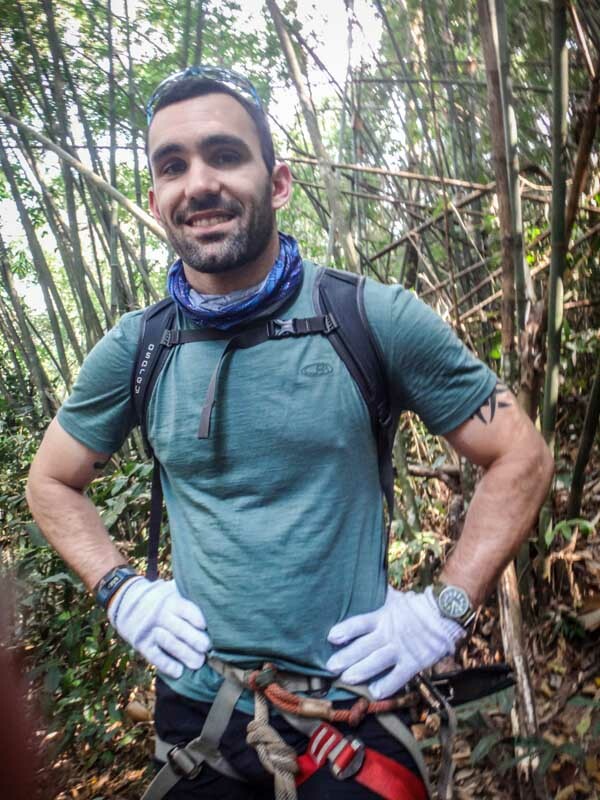 I understood that we’d be doing quite a bit more hiking and several more zip lines before making our way back to the village. In reality, we just made our way directly back to the “kitchen” where we picked up our harnesses on the first day (about 40 minutes from the drop-off point). This included only minimal hiking and just a couple of zip lines, which was actually fine as we were all pretty spent from the day before. We waited at the kitchen for about half an hour before heading back to the village. There, we had to wait a bit as well for the new batch of participants to arrive. 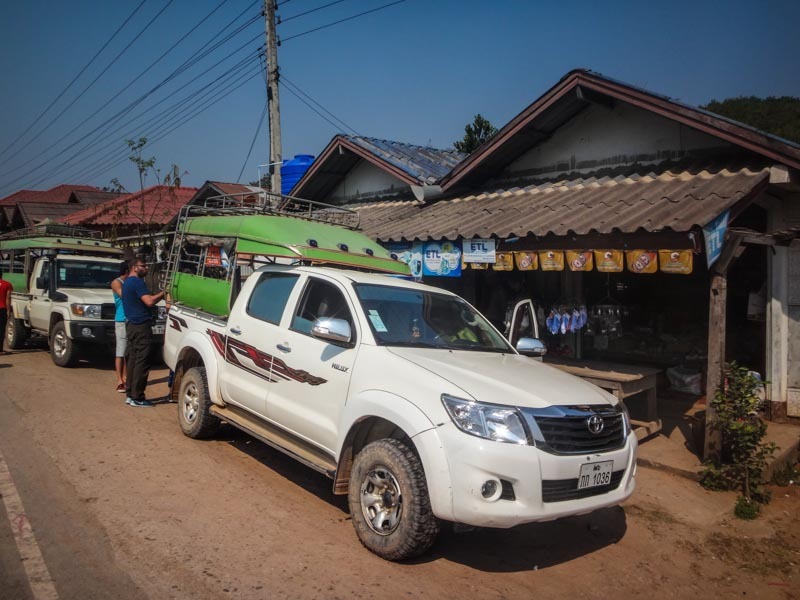 We then loaded into the trucks they came in on and headed back to Houay Xai. We were lucky enough to snag seats in the cab of one of the trucks (although we shared with another guy, making it pretty tight) which was much better than having to sit in the back again. 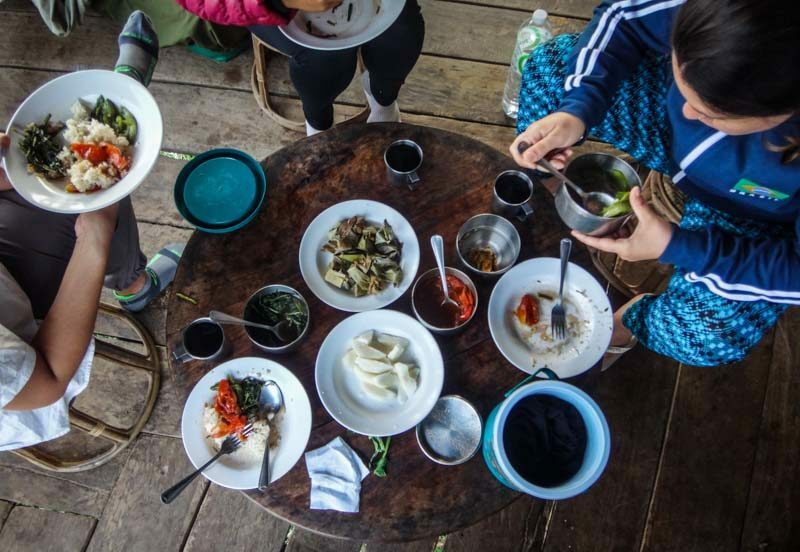 We stopped after about an hour (when we got off the dirt road and on to the main road) and had “lunch”, which has was rice and vegetables. 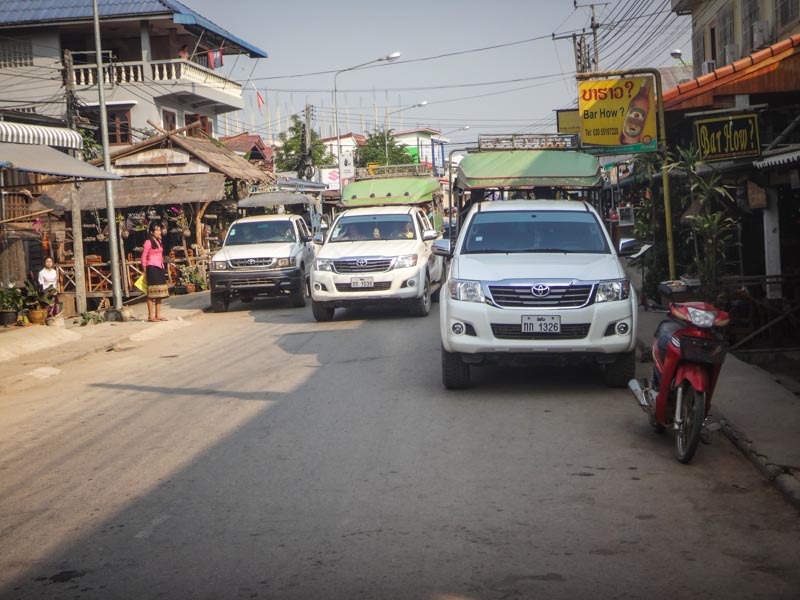 We then piled back into the truck and drove for another hour and a half back to town. Once we got back to town at about 2:15pm, we gathered our bags from the storage area and that was it–we were free to move on to our next adventure. 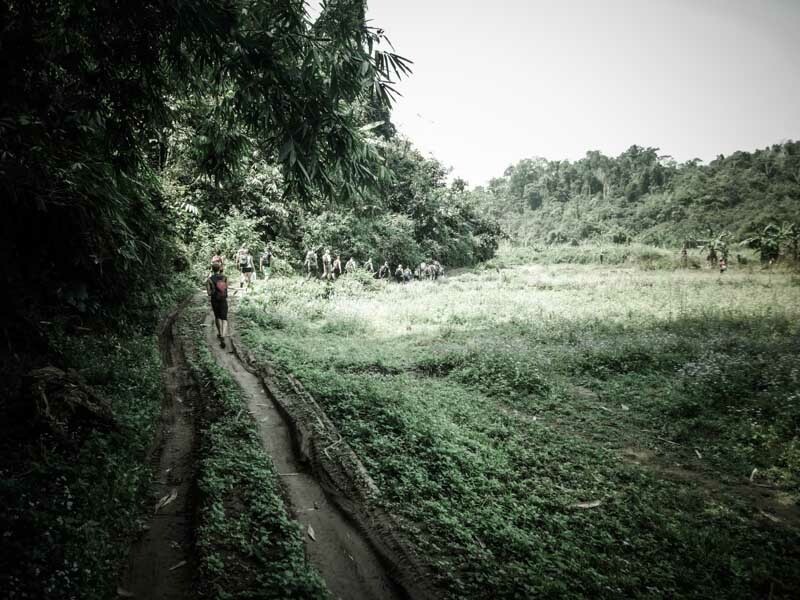 Transportation to the jungle from the registration office was cramped, uncomfortable, and stuffy. Riding in the back of a pickup truck sitting on hard benches for 3 hours along bumpy roads with 7 other people and 3 sacks of rice (our exact situation on the way out) was a pretty miserable experience. Other than one precarious section where we had to cross a stream, none of the roads we drove on would have been unsuitable for a minibus. 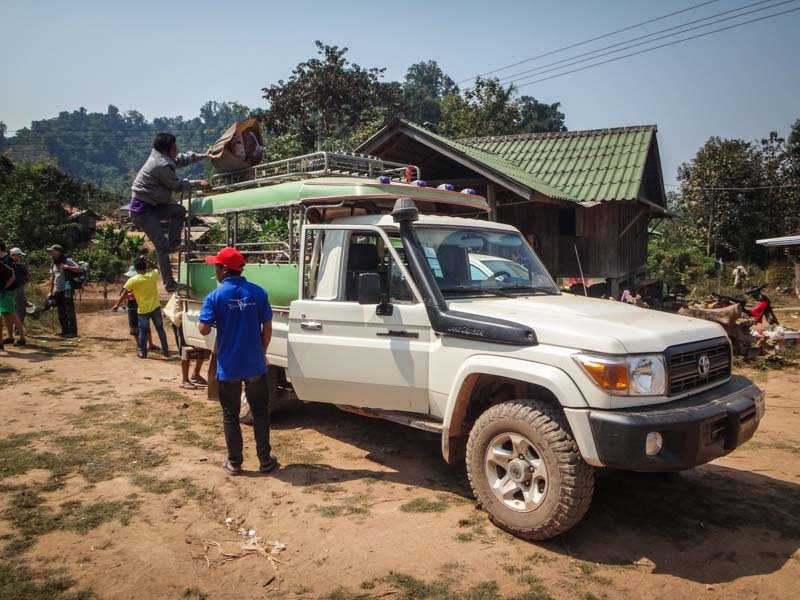 A minibus would have provided more storage for their supplies and a much more comfortable ride for the participants. When travelling to other countries, I fully expect communication issues. There are language barriers, technological malfunctions, cultural differences, and any number of other things which can cause misunderstandings. One thing I thought was great about this trip was that we could book the Gibbon Experience online and pay through PayPal. That was a fantastic (and unexpected) feature. However, when we first checked in at the office, they had no record of our payment. I had to get on WiFi and pull up my receipt, which I had handy for just this kind of situation, in order to prove that we had paid so that we would be allowed to go on the trip. In that same vein, as soon as we left the Main Office, almost nobody could speak English. 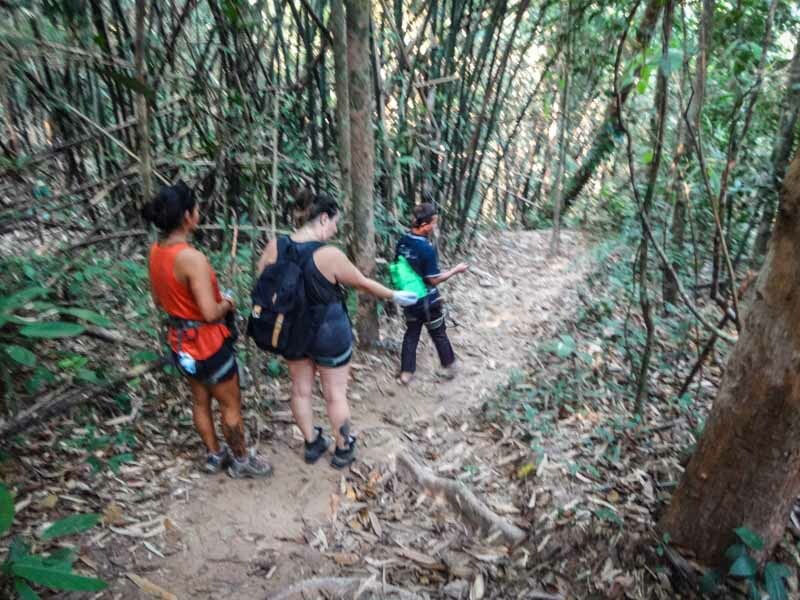 Of course I don’t expect everyone to be perfectly fluent and articulate, but it’s critical that our guides be able to communicate instructions and safety procedures in a manner that all participants can understand, and it simply wasn’t the case. One of our guides could speak limited English and the other could not speak any, which caused confusion from start to finish. Luckily the zipline harnesses and cable system is rather simple so they could show us exactly how to operate it without many words being spoken. However, there were minor miscommunication all along (for example, our itinerary on the last day) that were somewhat frustrating. 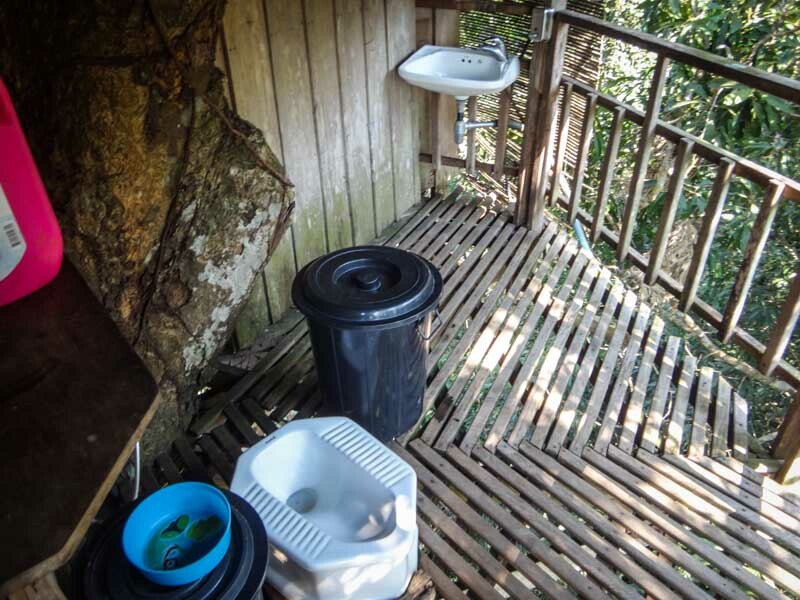 I know, this sounds crazy–privacy in the jungle? The whole point is to be out and one with nature! That is true, to a sense, but a company that really keys in on its audience (in our case, most were “high-income” backpackers) knows that having some privacy is important. We were assigned to a treehouse that sleeps 4, so we were grouped with two others whom we didn’t know. No problem whatsoever, they were perfectly nice ladies. 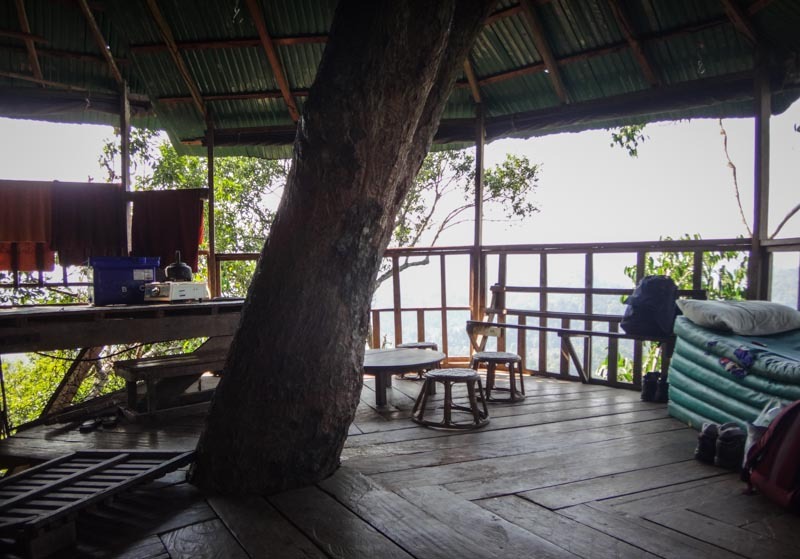 However, the first morning we woke up there was a group from another treehouse literally standing next to our beds at 8am. 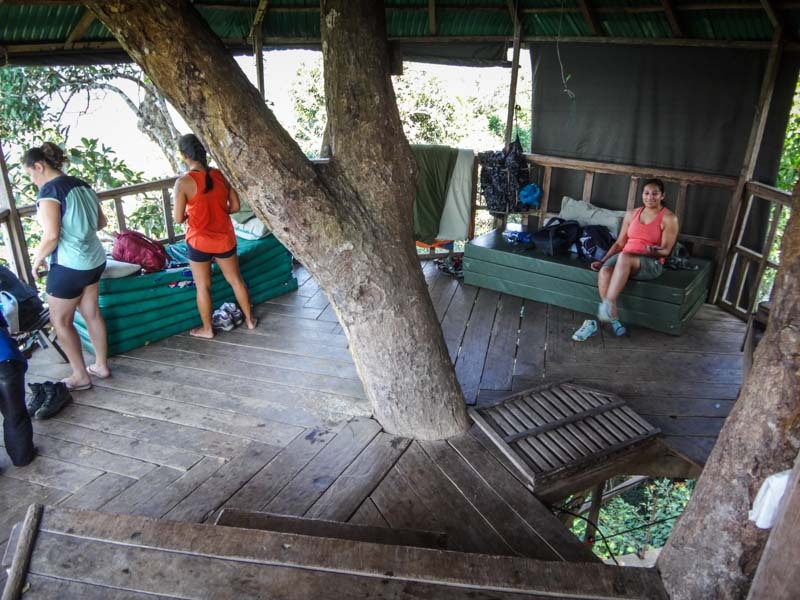 The idea, apparently, was for all groups to hike around and see the other treehouses, but they never told us this previously nor notified us that we’d have visitors first-thing in the morning. I felt somewhat imposed upon and like I was being forced out of the space that we had “rented” for our trip. 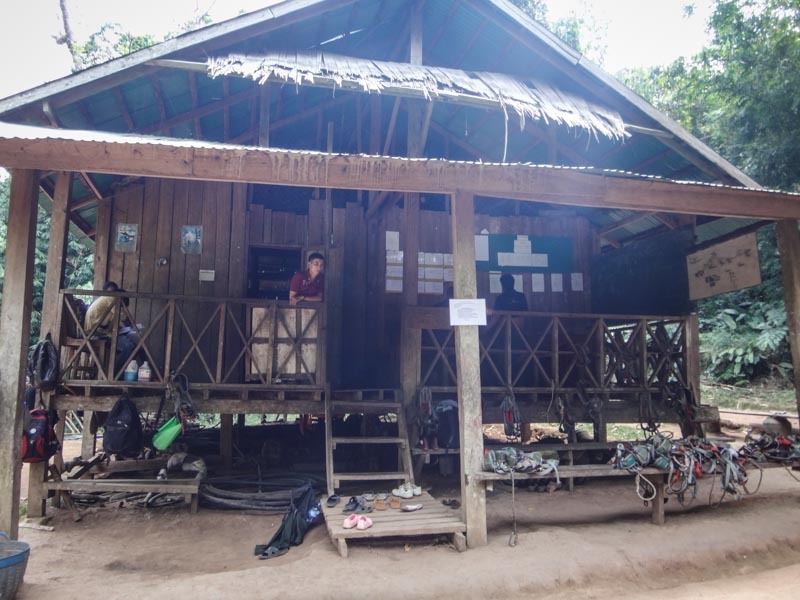 There also isn’t any storage in the treehouses, so your belongings are out in the open while groups of strangers are continually passing through. We weren’t afraid of anyone stealing anything, but just having to tuck things away and keep our underwear completely out of sight was a bit unexpected. Of course, we ended up doing the same thing to other groups as we invaded their treehouses all throughout the day while following our guide. At one point our guide simply left us at one of the other treehouses to have lunch, saying they would be back in an hour or so to continue. 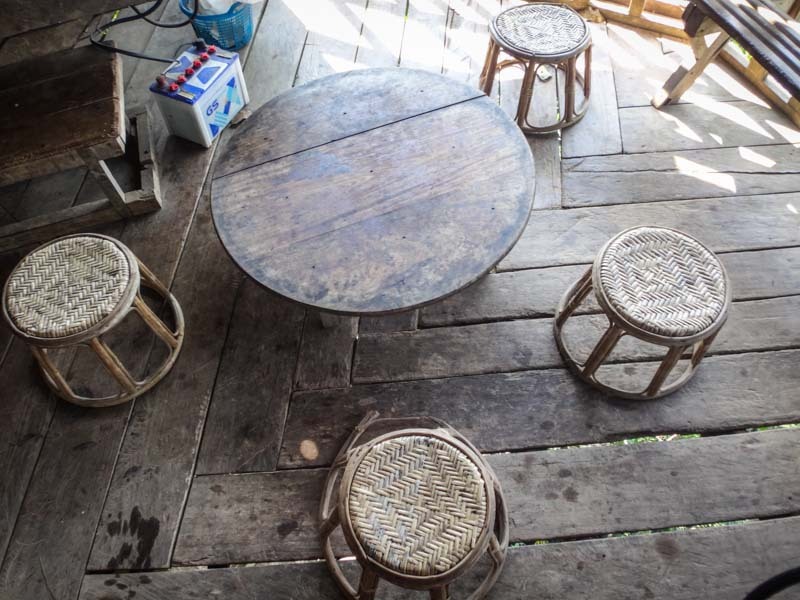 During that time, the group who was occupying the treehouse returned for their lunch only to find us sitting on their beds and at their dinner table, Goldilocks style. They were clearly annoyed by this, and I can’t blame them for being a bit crass. I felt very awkward the entire time, and because our guide wasn’t there to explain it looked like we had just strolled into their treehouse and were hanging out for the fun of it and looking through all their stuff. After a while we couldn’t take it anymore and just left, making our way back to the “kitchen” where our guides were having their own lunch and taking naps. They were confused as to why we had left the treehous, and we didn’t bother trying to explain. Arguments can be made on all sides of this issue. They have limited ingredients, space, cooking capabilities, and they bring your food to you on a zipline. All that is true and completely valid, but nevertheless the food could stand a makeover both in quality and quantity. As shown in the pictures above, our food was served in Indian-style stackable containers. There were 4 containers in the stack, each with a capacity of about 2 cups. There was usually one container of meat, which was probably a total of 8oz, and then the rest were vegetables. They also brought large quantities of fruit and a bucket of rice for each meal. 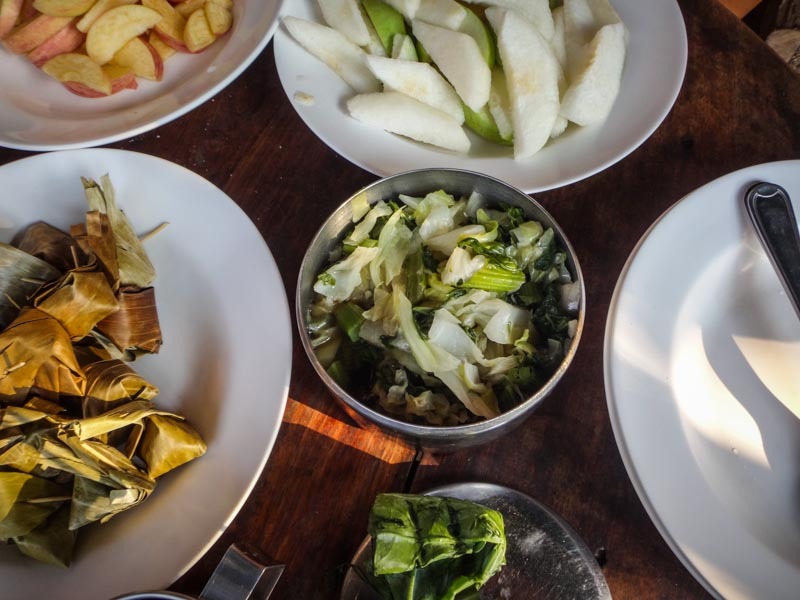 This was to feed four adults and simply wasn’t enough after we had been hiking in the jungle all day. 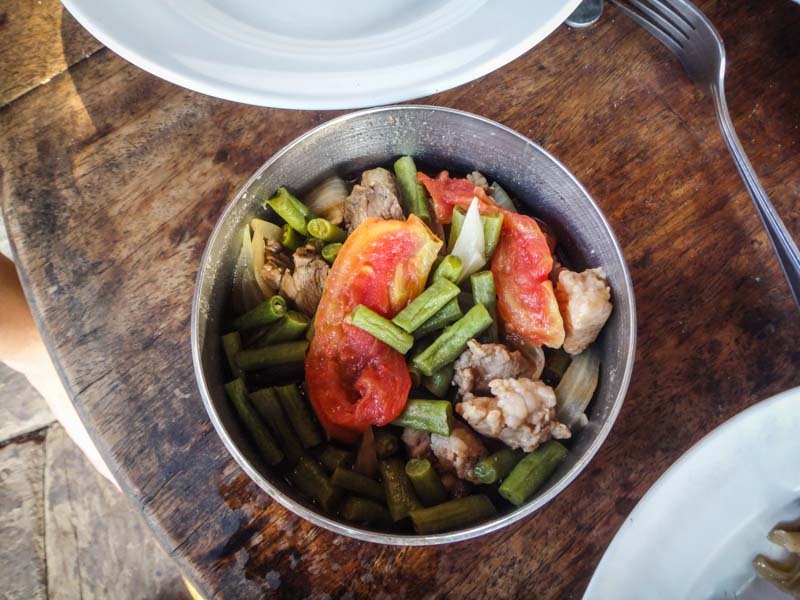 The vast majority of what they had for us was low quality, starchy, oily carbohydrates with barely a presence of protein which, in turn, made us feel lethargic, unwell, and still hungry. 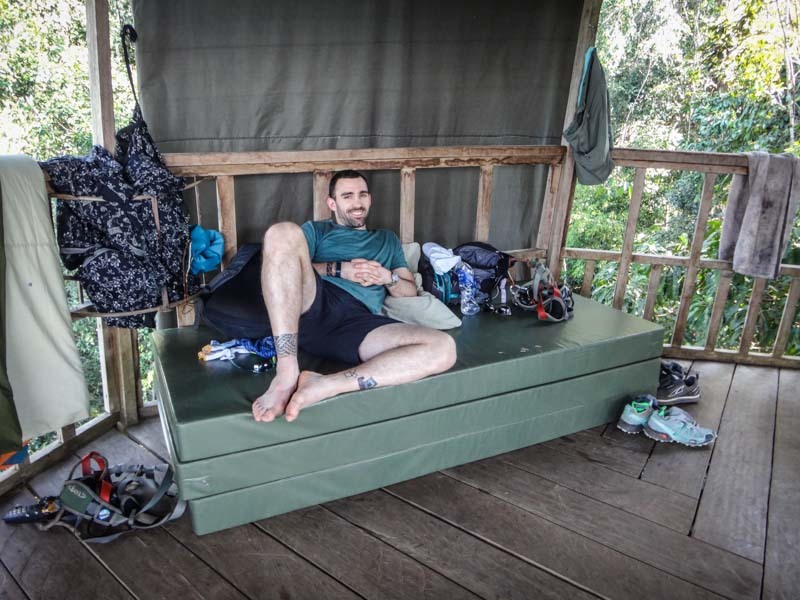 Luckily, we had brought a couple of protein bars and some trail mix along with us, which we had scarfed down by midday. Again, I understand this may be what the locals live on, but locals aren’t the ones going on this trip and paying the high cost. Value is about more than price–it’s the totality of an experience. If something is a great value, I don’t mind paying a high price. However, if the price is arbitrarily high and the value isn’t there, I feel like I’m getting ripped off (e.g. carnival fair rides, beers at a music festival, etc.). For example, when I was in Nepal I paid about $400 to spend a day and a half learning falconry and going paragliding with Egyptian Vultures. 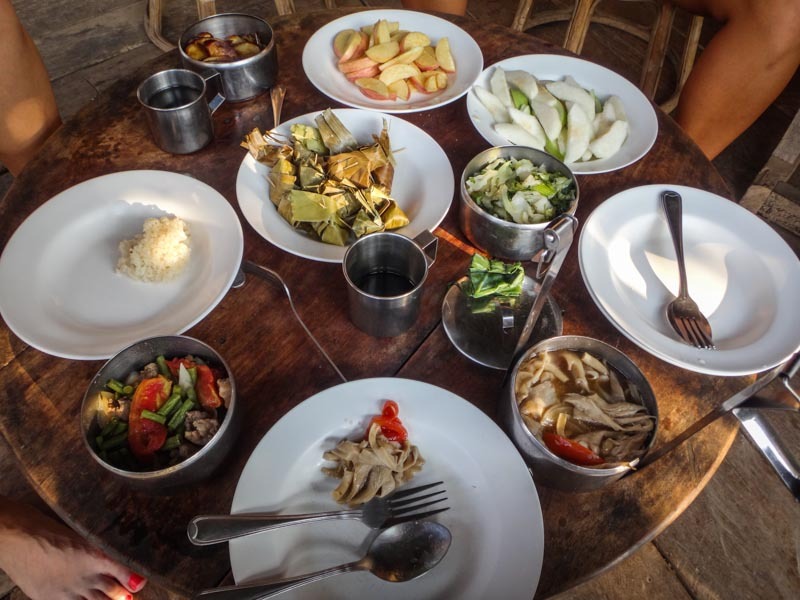 I learned a ton, supported vulture conservation, stayed overnight, and my meals were included. That was an incredible value. The price was high, but the amenities matched. I felt like the value for the Gibbon Experience was a bit misaligned for all of the aforementioned reasons. I’m not so naive that I don’t understand the constraints that the company is working with. They certainly have operating costs, maintenance, wages, and other expenses to cover in addition to their conservation efforts. I couldn’t begin to speculate their total monthly responsibilities, but I can conservatively assume that at $315 per person (and there were about 25 on my trip alone) they are able to cover those costs with a substantial amount of profit. Also, the things I’m discussing here aren’t deal breakers nor things I would even think twice about on a cheaper trip. If I were paying, say, $100 for this experience then I would have no problem dealing with some minor discomforts or lack of dietary variety. However, when I’m paying top-dollar for something (and in SE Asia, $315 is in that category), I have high expectations. 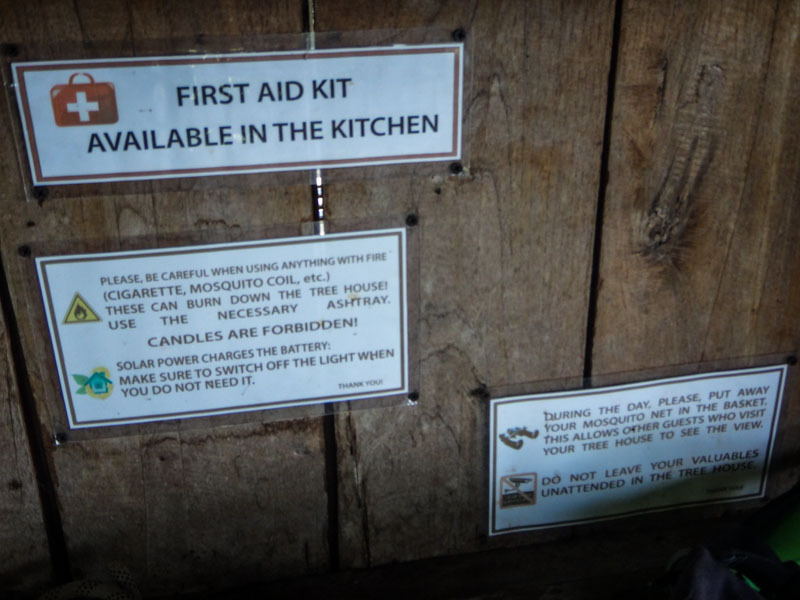 Despite there being a death on the experience just a couple of weeks after our visit (which I only found out about when researching for this write-up), I thought that the safety procedures were well-established. 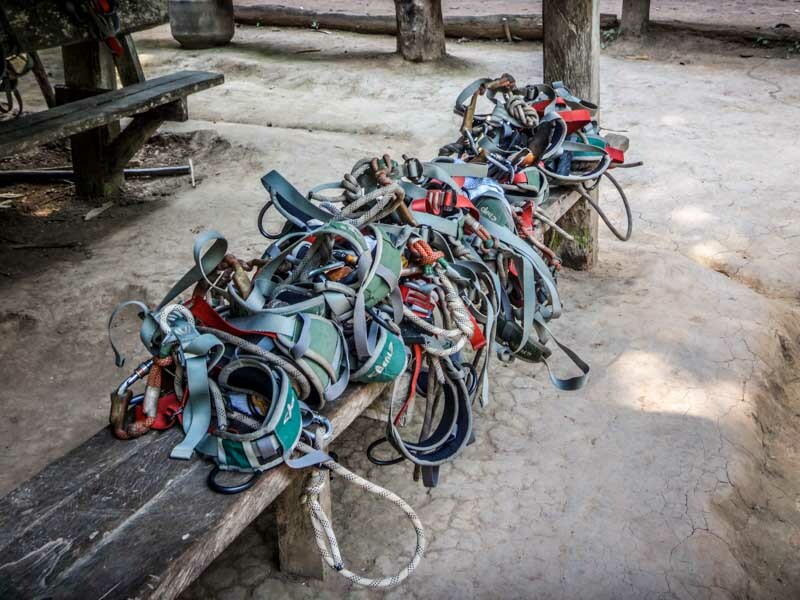 The guides made sure we knew how to connect and disconnect from the line and double-checked our harnesses before letting us go and seemed to do their best to make sure nobody got hurt. I’m not sure what the cause of death was for that person, but it could have been any number of things. While a tragedy, it’s the first time anything like that has happened there (so I read) and by all accounts I think they did a good job in this area. Everyone we interacted with on the Experience was as nice and welcoming as could be. As I mentioned, there were plenty of communication barriers, but everyone was in a great mood the entire time. They seemed to really enjoy the trip and putting smiles on people’s faces. If nothing else, the Gibbon Experience supports a cause that the founders feel very passionately about. 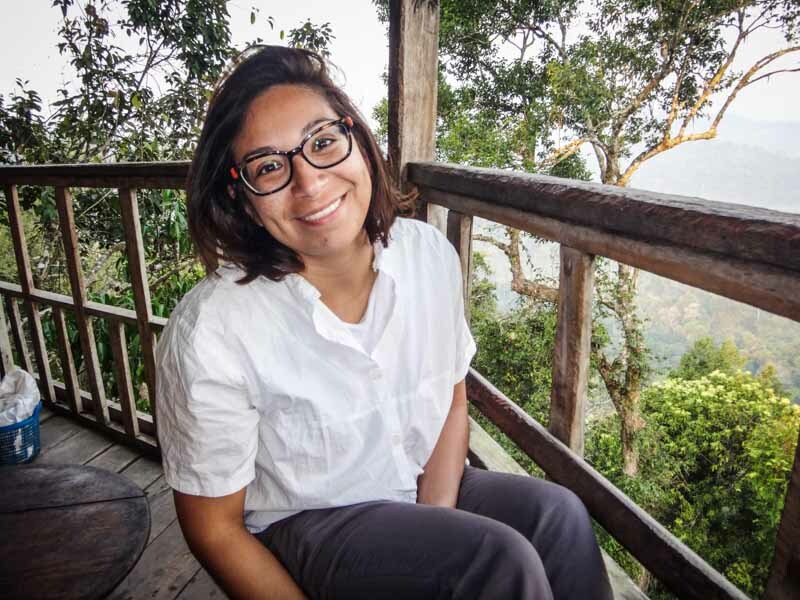 The state of the jungle and the at-risk wildlife are being positively addressed by the activities of this group, and through this experience they are spreading awareness while also supporting the local economy by providing local employment. It’s very noble of them. As I mentioned, we very much enjoyed our trip and would, in fact, recommend it to others and say it was worth it. That being said, there is a lot of room for improvement on their part in order to better align the price they charge with the quality and services they offer. 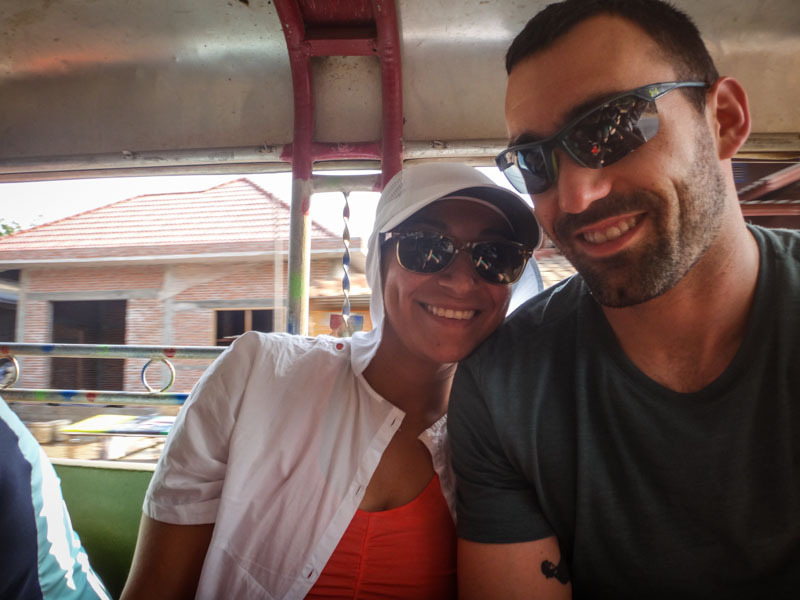 Despite it being a relatively poor value for the cost, it was one of our more enjoyable excursions and I simply want others to know what they’re in for. 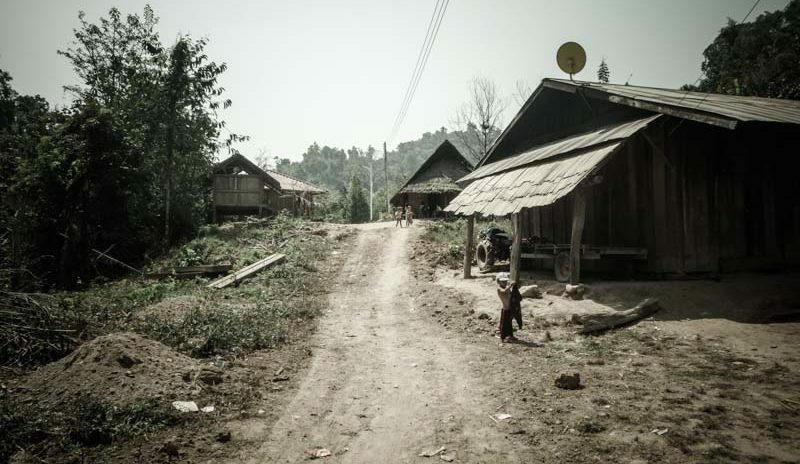 Finally arriving back in Huay Xai at about 2:15pm, we had some time to kill before our bus back to Chiang Rai at 4pm. We headed across the street to a hostel/café and had a drink, checked our email, and hung out until about 3:30. Our bus was supposed to pick us up outside the Sadaybee Guest House (where we stayed the night before the Gibbon Experience), but when we walked over all we saw was another tuk tuk with an extended bed and seats, like we had arrived on. Turns out, that was our ride. When we booked the bus, I explicitly asked if we were going to have to do the silly tuk tuk shuffle nonsense again and the guy assured me that we would not and that we’d take a bus directly to Chiang Rai. Well, that was wrong. It ended up being exactly the reverse of what we had to do on the way there: sit cheek-to-jowl in the back of a tuk tuk to the border, get our Lao exit stamp, wait for a bus to take us to the Thai border, cross (easier since we didn’t need a visa), then wait for another bus to take us to Chiang Rai. The only thing we cut out was on the tuk tuk ride from the Thai border to the bus stop, since we did actually have a dedicated minibus there for us. I say “us” as there were 10 of us heading to either Chiang Rai or Chiang Mai and they grouped us all together. It was mostly young Germans and Swedes who had also just done the Gibbon Experience and were moving on. 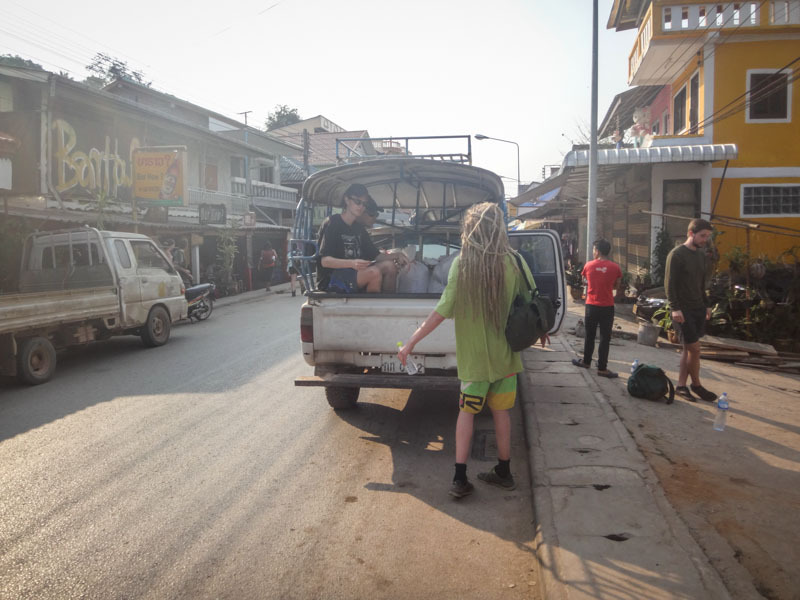 However, one of the Swedes somehow managed to not get his exit stamp in Laos and they wouldn’t let him into Thailand when we arrived, so he had to catch the bus back to the border (about a 10 minute ride), get his stamp, and then come back. Our driver was not in any hurry to leave, so he made us wait about 45 minutes for this guy to get his stamp and come back. Once we got on the road, the ride was easy and much more comfortable than our bus ride out there. One girl was getting dropped at the airport for a flight and we decided to get off there as well since our hotel was closer to the airport than the bus station. 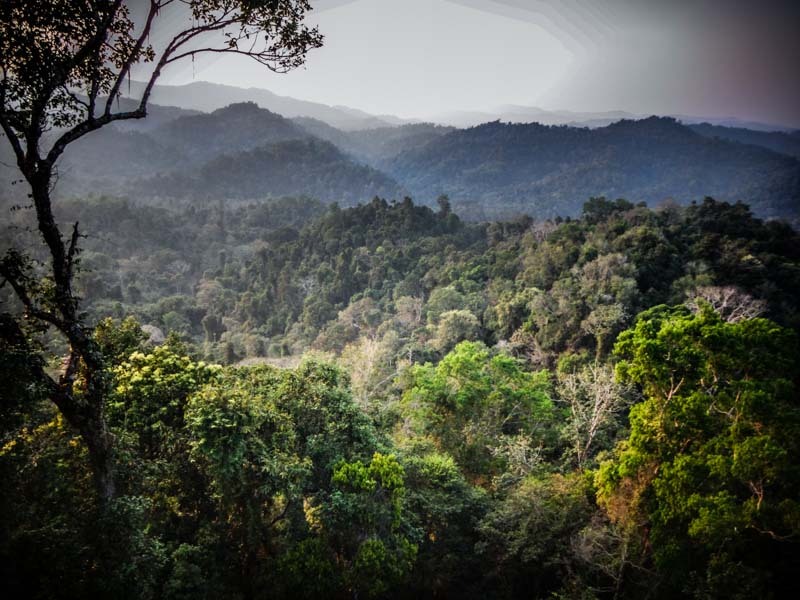 Next stop–Le Meridien Chiang Rai Resort! Thank you SO much for your detailed write up. Really comprehensive. The photos showed so much I wanted to know. I’m planning to go on the Classic tour Nov 2019. Annoying, but also good to know to expect “visitors” on waking, and the need to keep your stuff together and not laying around! Good to see what people were wearing to get an idea. Looks like trainers rather than heavy duty walking boots are ok. Again, thinking of weight. I notice none of you are wearing helmets but have read these are advised by others who’ve done it. Think they are offered so will take that up as too many bicycle accidents ( mine & others) where a helmet has saved us…in the unlikely event of something happening.